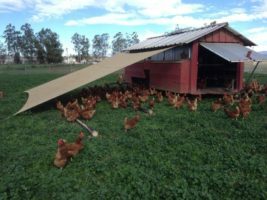 Here in the beautiful, rural town of Ramona located in the outer region of San Diego, California is the Happy Hens Egg Ranch. At Happy Hens we grow the freshest, tastiest, local, nutrient dense eggs on the market. We uphold a strong commitment to not only provide the best eggs to our local community but also to do it in a way that promotes sustainability as well as provide the best life for our girls. Our Happy Hens truly enjoy a “happy” lifestyle outdoors while having the freedom to express all their natural behaviors. On most picturesque days in Ramona, you can find our girls basking in the sun, taking dust baths, and foraging through our lush pastures for bugs and worms. In addition, they also consume superior Certified Organic Feed and Certified Organic Soy/Corn Free Feed. Our hens live in mobile barns fully equipped with fresh water and lots of perch and nesting space to shelter them from the country night critters. These barns are moved regularly (semi weekly/weekly) to ensure even fertilization of the ground as well as quality pasture for the girls. We also have our loyal day and night crew of Anatolian Shepherds who guard our girls from predators.